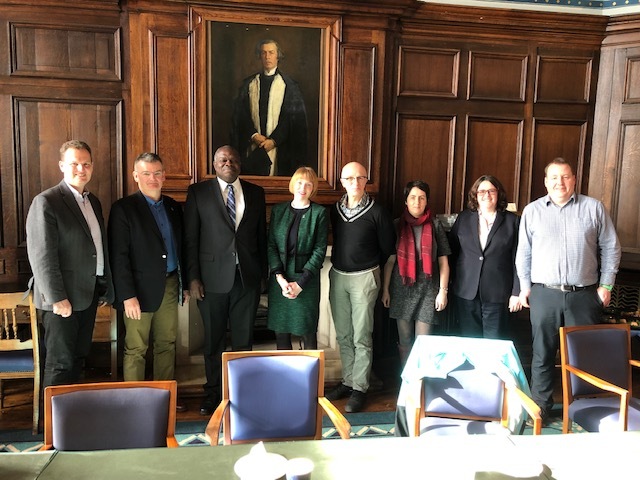 University of Glasgow played host to the Secretary-General of the African Research Universities Alliance, Professor Ernest Aryeetey, on 11th March 2019. The visit to University of Glasgow was at the invitation of the Dean for Global Engagement (Africa and Middle East), Professor Paul Garside. It was planned to facilitate follow-up discussions after the earlier meeting of ARUA Vice Chancellors and the Russell Group of Vice Chancellors in London last October. The Russell Group is currently chaired by Professor Anton Muscatelli, Principal and Vice Chancellor of University of Glasgow. In a tweet, Professor Muscatelli welcomed Professor Ernest Aryeetey to University of Glasgow. In this latest visit, the ARUA Secretary-General met with Rachel Sandison, Vice Principal (External Affairs), who hosted him to an informal lunch, attended by a number of senior academics and other staff of the External Affairs Office. The Secretary-General had separate business meetings with representatives of the four Colleges of University of Glasgow, namely Dr Chris Loughrey, College International Dean for Medical, Veterinary and Life Sciences; Dr Ian Watson, College International Dean for Science and Engineering; Dr Anselm Heinrich, College International Dean for Arts; and Dr Clare McManus, College International Dean for Social Sciences. He also met with Professor Andy Waters, Professor in Biomedical and Life Sciences and Professor Iain McInnes, Professor of Experimental Medicine/Director of Research Institute. All the discussions focused on possible collaborations between University of Glasgow and the ARUA Centres of Excellence. The meetings observed the close overlap between the six “research beacons” of University of Glasgow and the 13 priority areas of ARUA as reflected by the focus of its Centres of Excellence. Both sides expressed confidence in working with each other under the framework provided by the support from UKRI. They will also collaborate under the auspices of the European Research Universities Guild and the Russell Group. It was further agreed that University of Glasgow will assist ARUA in the setting up of its Centre of Excellence for Non-Communicable Diseases.